The UAE is not only home to the world’s tallest building, the Burj Khalifa, or one of the world’s most beautiful mosques, the Sheikh Zayed Mosque in Abu Dhabi – it is also renowned for its particular design ethos – ultra-modern but also rooted in a particular historical, geographic and cultural nexus. Dubai and Abu Dhabi have been described as glittering futuristic expanses, and also the home of rich traditional architecture. It is this blend of the new and old, the traditional and modern that is giving rise to a unique creative sensibility in the UAE – a design aesthetic that is always looking forward while never forgetting about the past; that expresses the vitality and strength of the country’s cosmopolitan population and its global economic power, articulating beauty, power and functionality. Alongside the efforts made by the country to diversify and increase economic growth, there has been equally strong attention paid to creating this growth on sustainable principles, as evidenced in the UAE’s commitment to the United Nations Sustainable Development Goals (SDGs) 2030, and the Paris Climate Agreement, as outlined in the UAE 2021 Vision and UAE 2030 Green Agenda. World Expo2020, hosted by Dubai, which will focus on sustainability: natural ecosystems and biodiversity, resources, sustainable cities and habitats, and climate change. These intermingled themes of economic vitality, environmental awareness and aesthetic sensibility all give rise to a unique mindfulness and the importance of the design of public and private spaces. In the UAE, the growth of unique residential and commercial projects is evident throughout the country – this growing awareness is also reflected in office design and fit out. According the Harvard Business Review, office surroundings are a statement of a business’ core values. Company location, office fit out and the placement of different teams all convey messages about the business’ culture, brand and values, whether this is done consciously or not. Office design needs to achieve a great deal more than just housing employees and executives. It needs to encourage employee productivity. It needs to signal the company’s brand and values to those same employees, clients and visitors, and it needs to do all that in harmonious and cost effective manner. Aesthetics cannot be divorced from function. The nature of work has changed over the last 20 years with increasing digitalisation, the wide spread adoption of mobile technologies and an increased focus on automation of mundane tasks alongside an emphasis on creativity and collaboration. Why people work has also changed. People have a desire for meaning and belonging alongside earning a living. Research has shown that we can spend up to 30% of our waking hours at work so there is the expectation that we do so in comfortable and healthy surroundings. It’s therefore fair to ask if the design of our working spaces has kept pace with the changes in working practices. At Summertown, we have always believed in the sustainability of office design even before it was fashionable to do so – we have been actively promoting “green thinking” for years. For this reason, we are very excited to see that other fit out contractors in the UAE are beginning to follow our example and to adopt a sustainable fit out philosophy. Our mission is to consistently deliver high-end sustainable interiors that enable our clients to achieve their environmental goals, improve energy, water and resource efficiency for their space, and deliver operational savings. Sustainability is embedded in our business and we use environmentally sustainable materials where possible on all projects even if the clients are not aiming for a green accreditation such as LEED. A sustainable fit out has many environmental, economic and corporate benefits but at its core, it means collaborating closely with interior designers, architects and our clients to create engaging work areas where people can feel healthy, happy and productive. A key trend we have witnessed which has become more and more important in Dubai and the wider UAE, is the custom tailored fit out solutions for companies that include activity based working areas, and integrated technology for a more agile workforce. Gone are the days of the one size fits all for the 20th century office. It makes more sense, is more efficient and in the long-run is more cost effective for companies to take the time to work with interior fit out contractors and designers to develop plans and arrangements that suit the way they do business and how they intend to grow – this requires reflection and self-awareness. A Smart Office can be defined in numerous ways. Fundamentally, it means the ability to use digital technologies efficiently and seamlessly. This includes multiple technology ports, docking stations, flexible cable management systems, projectors, web and video conferencing facilities, as well as “connected” furniture. Availing these elements can sometimes be a complex task requiring wiring, cabling and arrangements for wireless connectivity, as well as imbedding the ability to scale up as new technologies are introduced into the workplace. Some analysts predict the increasing use of, for example IoT and VR, at work, so any office fit out or re-fit will have to take this into account. The Smart Office also needs to provide solutions such as smart lighting, temperature control, security, and more. However, the overall goal is to provide a flexible work environment that enables agile, happy and productive employees. Until recently, open plan and minimalist design was all the rage. Companies tore down their walls and seated employees in wide open spaces. It was felt to be a great improvement from the rabbit hutch cubicle farms of previous eras. But some employees pushed back citing there was a lack of privacy and people felt undervalued. Many companies have found that the best formula is to provide their employees with different working options whether in the office or outside it. Activity based working interior designs are enabling employees space to concentrate on a complex task alone, or collaborate in small teams. Companies such as LinkedIn, Cisco and Airbnb have discovered that the key to creating the most productive working environment is to use a combination of different floor plans – integrating private zones and public working areas – open environment, cubicles, cafes, conference and meeting areas, etc. This is now possible because so many offices are digitally equipped to allow people to move from one location to another as they work on different tasks and projects, individually and in teams. The freedom given by the smart office, which allows people to work in different zones, assigned or communal, also means that fit out can make the most efficient use of all available spaces including stairways and corners. Accompanying the mapping of different private and public zones for work and rest, there will also be an increasing emphasis on the flexibility and adaptability of these zones. Furniture, cubicles, partitions, and even walls will be modular and moveable. The business environment is faster moving than ever before. Companies are faced with the need to scale up or scale down rapidly in terms of headcount and business lines to adapt to changing conditions. Imbedding this flexibility within office fit out from the beginning will save time, energy and money in the long-run. In a recent interior project for the Dubai Design District (d3), Summertown installed in their new Business Center folding modular walls, folding benches and stools. This high-end business hub incorporates a large communal area with wooden terrace seating, trees, swings and plenty of natural lighting. Work spaces are divided into rentable small unfurnished studios, hallway workstations, and a public collaboration rooms. Biophilic design tries to satisfy human beings’ innate and scientifically supported need to be close to nature, a need that has been denied and frustrated by traditional office settings. It has been shown that incorporating natural elements like plants, water features and natural lighting into the office space can boost productivity. Several research studies have recently demonstrated the various benefits of incorporating greenery into office design on employees’ physical and psychological health. But Biophilia extends to more than just increasing greenery. There are other ways of bringing a sense of nature indoors including increasing natural lighting, using natural colors, textures and materials, as can be seen in Summertown’s use of materials such as wood and rope in the Smart Dubai office fit out. DWP’s interior design of this office was directly inspired by the landscapes of Dubai, the undulating sand dunes and wide horizons. 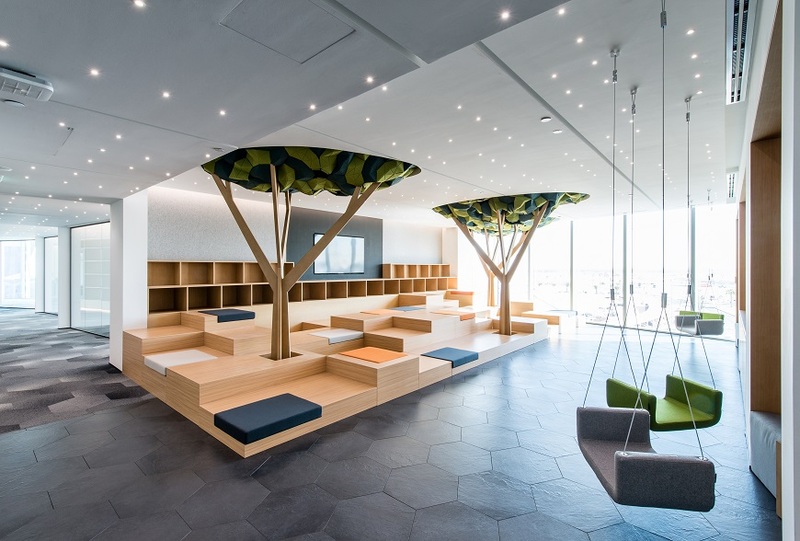 As in all cases, the way a company integrates Biophilic elements has to be aligned with many other factors including the space and resources available. Not all companies will be able to maintain a living wall, or a fountain, or to install skylights for example. Interior fit out specialists will be able to provide advice on the range of available options including small potted plants, moss and terrariums. The way we live our lives and the way we work are both changing radically. How this will impact office design in the long term will be very interesting to see. In the short-term, we expect to see ever more focus on sustainable fit out – reducing carbon emissions and waste production, increasing energy and cost efficiency, preserving the environment and improving indoor health (use of non-toxic materials; improving air quality). Clients will be more interested in incorporating Biophilic principles and in the inventive use of both natural elements (water granite, marble, rope, and sand) and man-made materials (like concrete and glass) as well as the use of recyclable materials. An interesting example is the temporary home of the Dubai Future Foundation, the world’s first 3D printed office building, which was built using a particular mix of cement and other materials designed and produced in the UAE and US. Finally, we see a movement away from the minimalist and stark décor popular in the late 20th century to an aesthetic that uses color, texture, sound, lighting and temperature control to create environments that are professional but comfortable. The focus will increasingly be on providing workers with beautiful adaptable digital spaces that help them to be happier, healthier and more productive.